Replace your expensive Helicopter Drop with our Drone Drop. Add money to your bottom line and save the hassle locating a pilot, getting FAA clearance, etc. Just book us instead and we will lift the pre-sold golf balls up above any tee box or putting green release and then measure the closest to the pin to determine your winner. 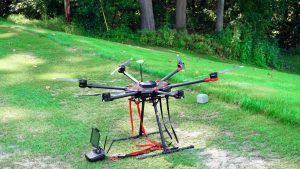 DRONE DROP for tournaments that are looking for a more economical way to replace a Helicopter drop. If you haven’t done this at an event, most coordinators will pre-sell numbered golf balls for $20 or $ 25 per ball and give the closest to the pin winner 50/50 split of the proceeds. Example…100 balls sold at $20 = $2,000 minus $200 (Drone Fee) = $1800 profit, split 50/50 with your group and 1 player. Click on the employment tab above! That is smoking HOT! ---The AR-15 or the Caddy Girls?...Both!